The vast number of parts were needing to be stored in a more efficient shelving system unit, but vertical space was more convenient than floor space in the client's storage building. Traditional shelving, both static and mobile, would not be sufficient enough for the Air Force Base needs. 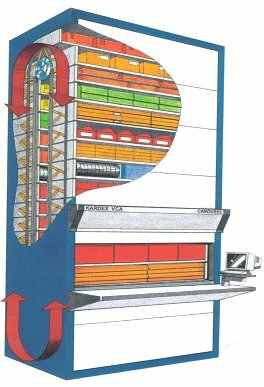 A vertical carousel, also known as robotic storage, provided the perfect fit for space usage within Hill Air Force Base. Compared to traditional shelving, vertical carousels make the best use of vertical space and doesn't require a ladder to reach products or inventory parts on a high level shelf. The Feature: Series of shelves that can be rotated. This allows access to the requested items more easily. Not only that, vertical carousels create a safe and convenient height for removal of parts stored within them. This prevents accidents or injuries. The Advantage: Either increased storage space or more efficient use of what is available. The Benefit: Improved effectiveness in the order picking process. Kardex vertical storage solutions are suitable for tools, office supplies, industrial and commercial hardware, parts, and consumables. Vertical carousels are automated storage systems which safely store precious inventory, and also makes it possible to gain access to a certain product with the ease of a button.